Protozoa are a varied group of single-celled animal-like organisms belonging to the kingdom Protista. More than 50,000 different types of protozoa have been described. Their name comes from two Greek words, protos, or "first," and zoön, or "animal." The vast majority of protozoa are microscopic, many measuring less than 1/200 millimeter. The largest, however, may reach 3 millimeters (0.1 inch) in length, large enough to be seen with the naked eye. Scientists have even discovered some fossil specimens that measured 20 millimeters (0.8 inch) in diameter. Whatever their size, protozoa are well known for their diversity and the fact that they have evolved under so many different conditions. One of the basic requirements of all protozoa is the presence of water. Within this limitation, they may live in the sea; in rivers, lakes, or stagnant ponds of freshwater; in the soil; and even in decaying matter. Many are solitary organisms, but some live in groups. Some are free-living, while others are attached to other organisms. Some species are parasites of plants and animals, ranging from other protozoa to humans. Many protozoa form complex, exquisite shapes, although their beauty may be overlooked because of their very small size. The vast majority of protozoa are heterotrophic. That is, they cannot manufacture their own food, but must obtain it by eating other organisms. 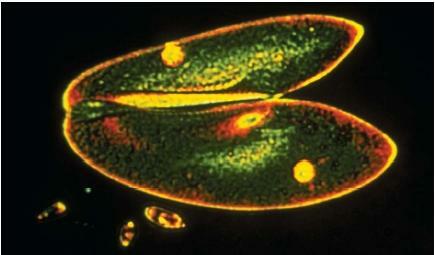 A few protozoa contain the green pigment chlorophyll, which allows them to make their own food. All protozoa reproduce asexually, by dividing into two parts at regular intervals. Some species, however, have evolved the ability to reproduce sexually also. Chlorophyll: A green pigment that makes possible the conversion of carbon dioxide and water to complex carbohydrates. Cilia: Tiny hairlike projections on the surface of a cell. Cyst: A stage in a protozoan's life when it is covered by a tough outer shell and has become dormant. Dormant phase: A period in which an organism is inactive. Flagella: Whiplike structures used by some organisms for movement. Heterotrophs: Organisms that cannot make their own food and that must, therefore, obtain their food from other organisms. Parasitism: A situation in which one organism lives in connection with and at the expense of a second organism. Protists: Members of the Kingdom Protista; primarily single-celled organisms that are not plants or animals. Pseudopods: Extensions of an organisms cytoplasm used for movement and capturing food. Symbiosis: A pattern in which two or more organism's live in close connection with each other, often to the benefit of both or all organisms. Protozoa have evolved mechanisms that allow them to live under a great range of environmental conditions. When these conditions are unfavorable, most species are able to enter an inactive, or dormant, phase. They secrete a thick protective outer wall that prevents them from losing water and protects the cell from extreme temperatures. This tough little package, called a cyst, may also serve as a means of dispersal (to spread widely). Cysts are carried away on the wind or on the feet of animals. Once a cyst reaches a more favorable environment, its outer wall breaks down and the cell resumes normal activity. Protozoa are classified according to the ways in which they move about. One phylum, the Sarcodina, moves by pushing out portions of their cytoplasm forming pseudopods, or "false feet." They capture their food by extending their pseudopods around it, engulfing it, and digesting it. Probably the best known example of the Sarcodina is the amoeba. Members of the phylum Ciliophora get their name from tiny hair-like projections known as cilia on the surface of the cell. These protozoa swim around by waving their cilia back and forth, like the oars on a boat. Cilia are also used to obtain food. As they beat back and forth, the cilia create a whirlpoollike effect that brings food close enough for the organism to ingest. A common example of the ciliates is the paramecium. The phylum Mastigophora consists of one-celled organisms that move about by means of flagella. Flagella are whiplike structures somewhat similar to cilia. The major difference between the two structures is that flagella are much larger than cilia. Also, flagellates have anywhere from one to several hundred flagella, while cilia never occur individually. The majority of flagellates live inside other organisms in either a symbiotic (mutually beneficial) or parasitic relationship. A well-known example of the flagellates is the organism that causes African sleeping sickness, the trypanosoma. Members of the phylum Sporozoa have no means of movement. Instead, they form sporelike structures and attach themselves to other organisms. They are parasitic and depend on their hosts for all their food and survival. The best known of all Sporozoa are probably members of the genus Plasmodium. These organisms are responsible for malaria, a disease that is transmitted by the Anopheles mosquito. Can you help with more information about protozoa type hard sponge growth in a waste water treatment process i.e. what is its expected food source?? nutrient, bacteria, algae etc? ?